External TH1 Thermistor Sensor connected by Terminal block. Display of Setpoint mapped to Comfort Counter. Enable or disable Setpoint is mapped to a Comfort Flag. Up/down keys adjust the Setpoint and enable/disable the setpoint. Assignment of Comfort Output to control relay to achieve setpoint. Temperature Alarm Monitoring by mapping to Virtual Input in Comfort. 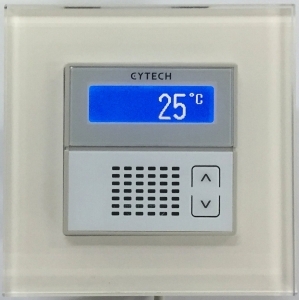 This allows a Temperature alarm to be activated when the temperature exceeds the setpoint by programmable alarm offset. The Alarm can dial to mobile phones or trigger SMS messages via the UCM/GSM module. Restore Temperature by SMS is possible. Up to 15 TSMs in a network. Comfigurator is used to program TSM01 and upgrade firmware. Up/Down Setpoint button mapped to Counter. Up to 15 TSM01s in a Comfort, Logic Engine or UCM/Logic network. A UCM/USB, UCM/Ethernet, or UCM/Logic is required to connect to the computer running Comfigurator. Run Comfigurator, go to the Modules Tab and right-click Controller or Sensor folder symbol as shown below. 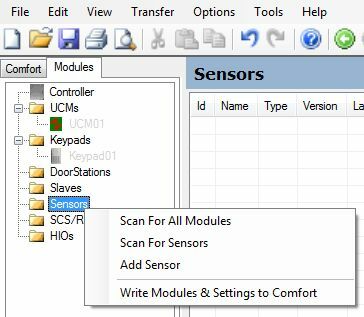 Select Scan for All Modules or Scan for Sensors. This will scan the network for TSM01. 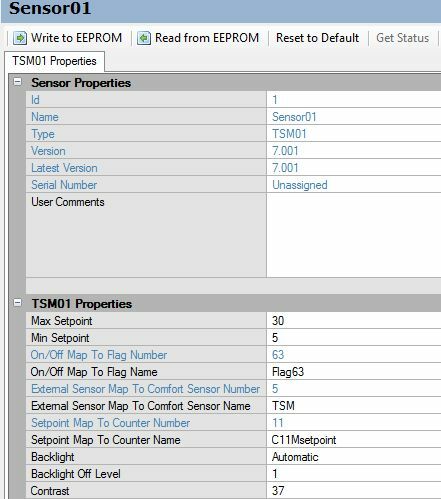 “Add Sensor” allows you to manually add a TSM01 if not currently connected to Comfort, i.e. when doing programming off-line. The result of scanning or adding a TSM01 is shown below . “Name” is any text description for the TSM used to identify it and serves no other function. “Version” is the firmware version which in this example shows 7.001. If the TSM01 was manually added instead of being scanned, the firmware information will not appear. “Latest Version” is the latest release version available when internet connection is present. “Status” shows the status of TSM01 It is ‘Polled’ when the TSM is found in the network and is polled. ‘Not Polled’ will be displayed when the TSM is detected by scanning but the number of TSMs programmed is less than the TSM01 Id. ‘Not Found’ is shown when the TSM01 is not connected to Comfort when scanning is done. 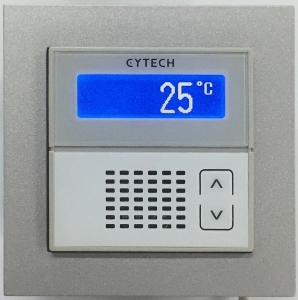 The LCD shows the temperature in Celsius together with the setpoint if TSM01 is connected to a Comfort controller. Pressing the Up or Down buttons will display and change the setpoint. The setpoint is mapped to a Counter. If the Counter is not mapped, or TSM011 is operating as standalone mode, then the setpoint is not shown. Pressing and holding Up and Down buttons together will alternately switch on and off the mode The On/Off mode is mapped to a Flag. The ON/Off mode for the setpoint is toggled by pressing on both up and down buttons at the same time. If the mode is OFF the Flag that is mapped to On/Off Mode is cleared. This acts to turn off the thermostat function in IRIO or Comfort logic and if the mode is on, the mapped flag is set to enable the thermostat function. Changing the flag to on or off in Comfort also changes the display mode of TSM01.